On my trip to Breckenridge, Colorado earlier this month, I only took along my iPhone 6 and my Pentax P3 35mm camera that I picked up last summer. I’ve taken so many photos with DSLR’s there over the past several years, that it was refreshing to not only be shooting film, but to constrain myself to what a few roles of 36 shots would allow, instead of a nearly infinite number of digital shots. I’ve had some rolls of Ektar 100 and Tri-X 400 for several months, and after picking up a polarizing filter to use for color and black and white, and a yellow filter specifically for black and whites, I knew I’d have a good time exploring some of my favorite parts of the mountain. We spent three days at Breckenridge, and one day at Arapahoe Basin. Overall, the Tri-X 400 shots came out pretty well. I’m trying to recall if the days I shot these photos were as overcast as they appear in the photos below; being my first time using a yellow filter, I wasn’t sure what to expect, but I think the photos rather accurately represent what I remember being low-light days where we had our fingers crossed for fresh snow that never came. I did have a mishap with the roll of Ektar, and it got torn apart near the beginning of the roll as I was winding it back up. Until I got back to our condo and could establish a pitch black room in the bathroom, I wasn’t sure of how disastrous this would be. Luckily, 95% of the roll had been wound back up, but unfortunately the developed photos showed that a decent amount of light must have affected some of the shots. As with anything, photography is a learning experience full of trial and error, and occasional moments of frustration. But we can learn from all that, right? So, the following photo is what I’m hoping to not have happen again. Above: the outcome of a torn roll of film in the camera that let light when opening the film door. I ended up with only two decent color photos from that roll, but I was happy with the photo below of the flag just below the peak of Peak 6, and one looking south towards Peak 7. I was pleased with the outcome of the black and white photos, some of which you can find in a gallery here. These came out with a bit more grain than I was expecting, which I’m not sure comes from the combination of a stacked polarizing filter and a yellow filter, or the vendor’s scanning process. This looks a bit more like a higher ISO film, which isn’t a bad thing, but I just didn’t expect this level of grain. For a combination of forests and snow, I think the contrast is decent, and I’d love to be back there and experiment with and without both of those filters. Above: The early part of a one hour hike we did up to the Back Nine, a hike-to area on Peak Nine where good snow can found even several days after a storm. Above: Towards the end of the Back Nine hike. The terrain here was a mix of rock and windblown snow, and while not steep, required a lot of cautious steps to avoid slipping. The textures of snow and rock where nice around here. Above: Looking down on Broadway and Twin Chutes in the Back Nine area. Above: Looking east across the town to Mt. Baldy. Above: All of the Back Nine area ends up beyond these trees in a tricky runout along a creek, which gets pretty tough on a snowboard. 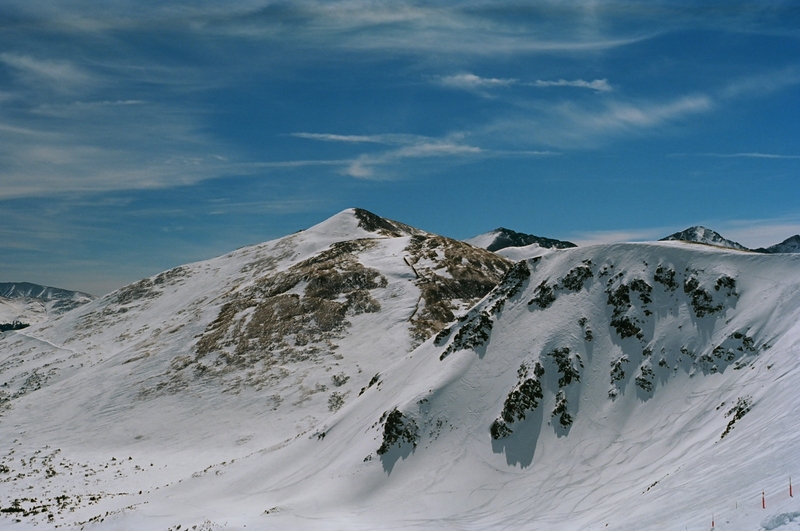 Above: Looking north to Peak Eight, the Six Chair are, Imperial Bowl, and some of Horseshoe Bowl to the right. This has long been one of my favorite parts of the mountain; Six Chair runs are a blast with good snow. We also spent a day at Arapahoe Basin, which I’d never been to before. It’s a fun mountain that I’d love to ride with a lot of fresh snow. The photos of the East Wall came out pretty well, with the rocky cliffs making for some great textures. Above: Looking towards the East Wall at Arapahoe Basin. Altogether, shooting film on this trip was a great experience. It definitely impacts the time you spend on a mountain, and while I wish I’d taken more photos, it was nice to be a bit more restricted in how often I took the camera out of my backpack. I’m missing winter already, and can’t wait to get back there. Never easy to capture snow and background content and nail the exposure especially with film!! Lovely photos. Thanks for pointing me to them.